November 12th in Premium Themes by Wordpress Jedi . I don’t know about you but I have always been fascinated with new technologies and what’s better than blogging about what you are passionate about. It’s true that Slash Dot has been very successful at running their tech oriented blog (though they are not more than just about technology). But you can always a micro-niche in this broad niche and make decent money. Technology blogs can be monetized easier through media ads and contextual advertising than other types of blog but that is a discussion for another story. ModBlogger – Tech WordPress theme is designed for folks who are looking to run a super geeky WordPress blog. The designer has put a lot of time and effort to get the colors right for the theme. Tech ModBlogger is XHTML and W3C compliant, and it is optimized for SEO. You have breadcrumbs all over the blog which makes it yummy for search engines. The pages are drop-down-based, which makes it very easy to add multiple pages and sub-pages. You also get to highlight the products you want on the top of your blog in a slide-show fashion. The RSS button is located in a prominent place, making it easy for folks to subscribe to your RSS without having to search for it. And finally pagination is also provided with this theme. ModBlogger is an excellent theme if you are trying to get into the tech blogging niche. It’s very attractive and highly customizable. I would’ve liked to see different colors to choose from for this theme. Also, having the popular posts section is great, but there is no place to show the most recent posts (which could be added in form of a tab). Finally, since the logo is text-based, you will most definitely have to create one from scratch. I would’ve liked to have a sample Photoshop logo to work with. Verdict: 4/5. 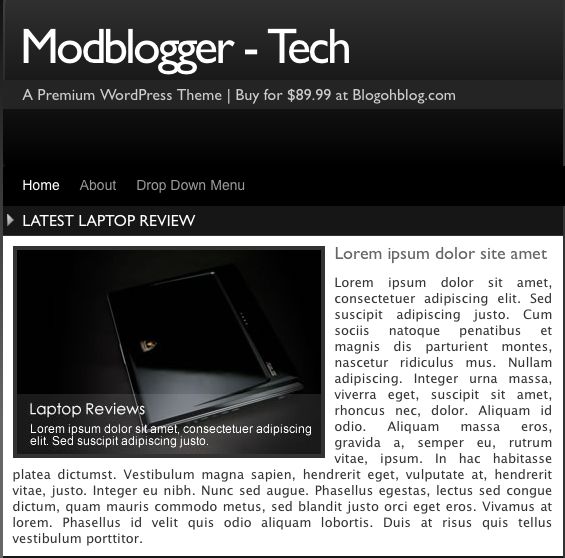 Modblogger Tech WordPress theme is an attractive theme that can be used for tech bloggers. It’s highly optimized for SEO and uses JQuery to give a Web 2.0 look to the blog. It could use some minor improvements but in general is worth the price if you are starting a tech blogging business. You can see a demo here, or you can buy it right here. Previous post: How To Protect Your WordPress Against Hot Linking?